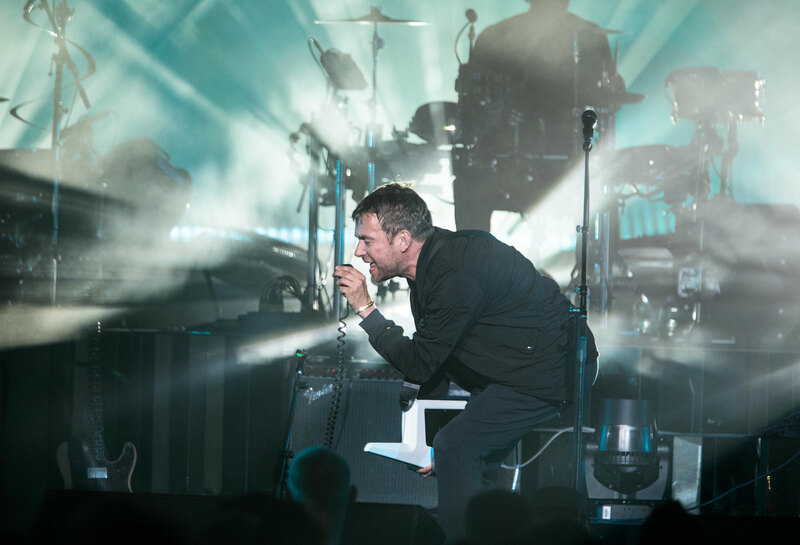 In a rare Boston appearance–their first in seven years–the genre-defying Gorillaz brought their full-band roadshow to the Blue Hills Bank Pavilion on a torrentially rainy Wednesday night. Damon Albarn and Jamie Hewlett’s “virtual band”–part digital art project, part all-encompassing musical collective–has embarked on but a few expansive tours despite a nearly two-decade history, and excitement was palpable among a capacity crowd despite the flash floods taking place outside the venue’s tented confines. Long Beach rapper Vince Staples served as the night’s coolly confident opener. With the front lights low, a sparse orange backdrop glowing behind him and the rain still falling, Staples alternated cuts from his lauded 2015 debut LP Summertime ’06 and his stellar June release Big Fish Theory in effortless, assertive style. A half-full outdoor theater is never the best venue for this sort of thing, but judging by the crowd’s response (to the woozy opening notes of “Norf Norf” in particular), he had plenty of fans in the room. Gorillaz drew an immediate and sharp contrast to the economic presentation of their tour-mate, emerging as a 13-piece band (that’s counting the six backing vocalists) in a live show that rarely let up from the bombast. The overstuffed nature of the group’s April-released record Humanz certainly carried over to the stage, and it worked better there than in the studio. With multiple percussionists, guitarists and a small choir, among others, they had no trouble pulling off the genre-hopping from hip-hop to trip-hop to alt-rock and beyond. Visuals, naturally, played a role in the evening as well, illustrating the adventures of the group’s virtual members in oversized and vibrant fashion on a screen behind the actual performing band. Immersive as the video could be, though, there was no hiding behind computer-generated gimmick here. 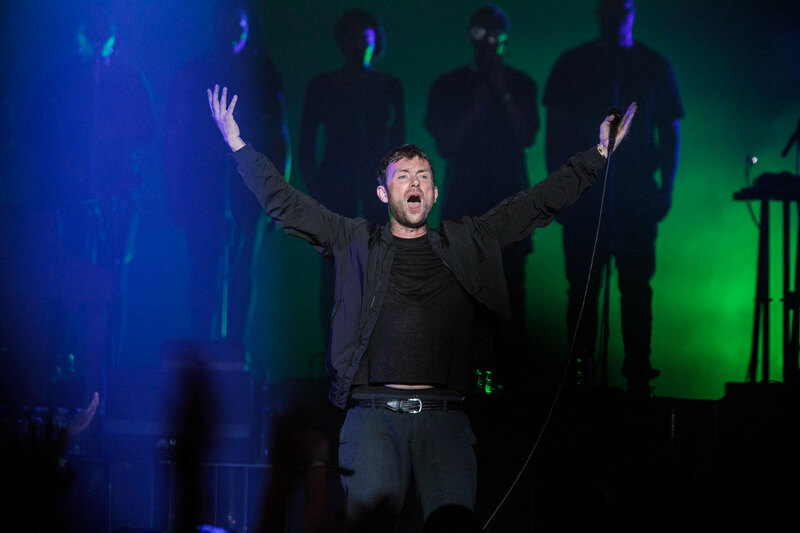 An endearing technical screw-up or two humanized the oversized collective on stage, and Albarn took a few opportunities to converse with the crowd, even playfully admonishing one fan for requesting a Blur song. At nearly two hours, and spanning from the group’s 2001 debut up through their recent work, the set was an impressive feat that sought to give an enthusiastic crowd its money’s worth, and succeeded. Even while Humanz represents some of Gorillaz’s most undercooked material, the new songs brought smiles alongside the Demon Days, Plastic Beach, and self-titled record favorites by way of sheer enthusiasm. It was a joyous display well worth those lengthy waits between tours. Click below for a gallery from the show.